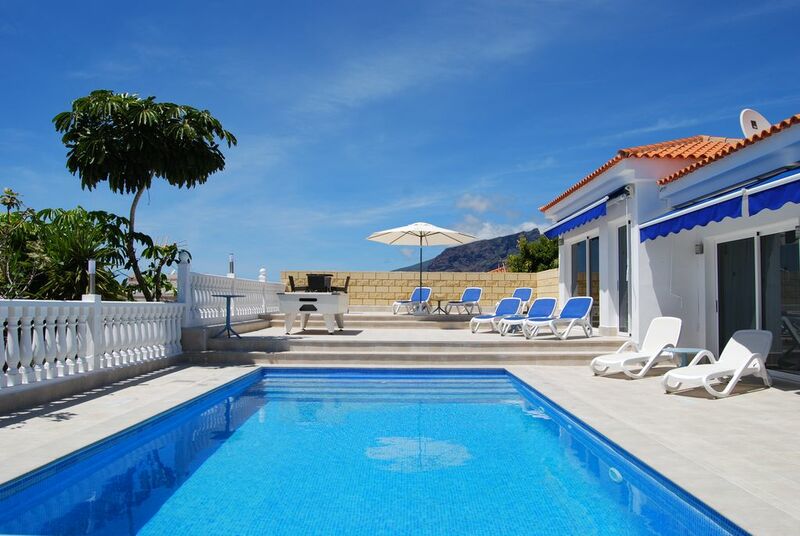 Our beautifully light and airy villa is fantastic for large families or those travelling with friends, as it sleeps a maximum of 10 adults and a baby in a cot. Our 5 * reviews are absolutely worth a read to reassure you that our villa is consistently high quality - don't be disappointed by booking something else! There is high speed fibre broadband for those that need to keep connected and a pool table located on the terrace, perfect for keeping everyone amused. The accommodation is approx 2500sq. ft and has an open plan living area that has multiple sliding doors that open out onto the south/west facing sunny terrace and heated pool. The contemporary feel is generated by the leather sofas in the sitting room with 42" plasma TV and the superb kitchen with integrated appliances. There are 5 large bedrooms (twin beds in each room), each bedroom has modern luxurious en-suite facilities so that everyone has privacy. There is UK Sky TV, Apple TV box and astra satellite with German/French/Austrian etc channels. Due to the elevated location it is a short downhill walk to the seafront and black sand beach and a slightly longer energetic walk on the way back! Booking my villa gives access to a local Concierge company who can arrange paid services such as delivery of shopping, transport from the airport, boat charter, trips etc before you travel. PLEASE NOTE - I do not accept bookings from groups of under 30's of the same age. All bedlinen changed weekly. If staying for more than 1 week but less than a whole week there will not be a further change unless agreed. Lots of free parking on road immediately outside the villa. 2 towels provided. Clients need to bring their own pool / beach towels. Sitting room with TV with UK Sky and European channels, DVD player. Well equipped kitchen with every utensil supplied. Food blender. Modern kitchen with granite work surfaces and breakfast bar, oven with electric hob, American fridge/freezer, dishwasher, microwave. Large south facing paved terrace surround the pool, with lots of space for 10 sunlounders and a pool table. Covered dining area with sunblinds all along the rear of the villa to provide extra shade. Lovely large south / west facing terrace that has sun all day. 9 metres x 4.5 metres. Depth throughout 1.4 metres ie NO deep end. Notes on accommodation: For those with small children, there is FREE use of a cot, highchair and stair gates, just mention it at the time of booking. Therefore the villa sleeps 10 adults and 1 baby. Air-conditioning is available at an extra charge of £100 per week - there are 6 units, 1 in each bedroom and 1 in the sitting room. I don't think you will need it November to March but it is worth considering from April to October. Outside: Large wide paved terrace with private heated swimming pool 9 x 4m. Dining table and chairs. Charcoal barbecue. Sun loungers. Pool table. Utility Room: Washing machine, clothes airer, iron and ironing board, drinks fridge/freezer. Cleaning / Towels / Linen / Maid service: Linen and towels changed weekly. Other: Study area with WIFI broadband. it's a lovely spacious villa with all the facilities needed for a great holiday. lovely that there were cooking bits already in the fridge and cupboards so you don't have to buy everything from scratch. the heated pool is great, we used it everyday, kids loved it. it's surrounded by a lovely sunbathing area and out door covered eating space. short but hilly walk down to the playa de la areana beach and bars/restaurants. beach was nice to play on but waves too big in February to swim. had a lovely meal at the fisherman's inn in puerto Santiago. big supermarkets a short drive/taxi ride away. This is a wonderful place to stay for a relaxing holiday. The villa is great, it's spotlessly clean, comfortable and well equipped with plenty of space for everyone. The outside area is no less impressive with a sheltered outdoor dining area (where we had all our meals), a lovely good sized heated pool and plenty of sunloungers and chairs. The terrace also has wonderful views. Would thoroughly recommend for anyone wanting to stay in the Playa De La Arena/Los Gigantes area as the restaurants and beaches of both are easily walkable or a short taxi ride away. Great holiday with the family, lovely villa would highly recommend it. We were a family of 9 (6 adults,2 children) staying for 2 weeks. From the moment we booked the villa Madeleine was nothing but helpful. On arrival we were not disappointed, the villa was very clean and exactly what was shown on the website. It is very spacious and prefect for the whole family. The children loved the pool which was cleaned twice while we were there. On our travels we found a wonderful little bar/restaurant only a 5 min taxi Journey away (Tipsey Terrance), we would highly recommend and you can play mini golf. Thank you so much for a fantastic holiday. I have just got back from a family holiday staying in this amazing villa and don't have a bad thing to say about the place! Arriving at the villa we were all very impressed, it's beautifully presented, clean and feels like a second home. We were also very grateful for a fully stocked kitchen which we did not expect but was a very welcome bonus! Perfect place to stay and will definitely be staying there again in the future! The black sand beach at Playa La Arena is 7-10 minutes walk downhill. It is one of only 16 beaches on the island of Tenerife that has a prestigious 'Blue Flag' awarded for facilities and cleanliness. You will also find a plethora or bars, restaurants, supermarkets and shops. A short 10 minute drive (€5 in a taxi) to Los Gigantes with its magnificent cliff dominating the marina. There is a further wealth of bars, restaurants and shops in this well known village as well as another black sand beach tucked away. The villa is 40 minutes driving distance from the airport at Reina Sofia. Even though local taxis are cheap for day to day use, we recommend that you hire a car at the airport which secures your transport to and from the villa. Playa de la Arena is within 7-10 minutes walk to seafront or 2 minutes drive. Los Gigantes is approx 3 miles away (€5 taxi). Mini market - 380 yards. Supermarket - 440 yards. Restaurants - 380 yards. La Arena Beach - 380 yards. Airport - 20 miles. Booking Notes: Please email to confirm availability. Initial booking deposit of £250 to secure the booking and for breakages. All rental payments are required on booking. The deposit is reimbursed once the villa has been checked. Changeover Day: Flexible changeover day. Dependent on other bookings.